The main north-south arterial street in the Central District (my neighborhood) is going to get a big complete streets makeover in 2014-15. Currently designed like a four-lane highway, 23rd Ave is by far the most dangerous street in the neighborhood. Instead of being the heart of the CD, it is a barrier that slices the neighborhood down the middle. The draft Bicycle Master Plan map suggests 23rd Ave as a potential candidate for a protected bike facility. While the BMP has not been finalized or adopted yet, I personally endorse the idea strongly. There are many businesses and destinations on 23rd that are simply not safely accessible on a bike. This is not a shoo-in, though. I have already heard talk of creating an “alternative” route for bikes (side streets that could be neighborhood greenways). As we have written before, this is a huge mistake and a misuse of the neighborhood greenway idea. This is our chance to do things right, and that includes safe bicycle access, fast buses, safe crosswalks and comfortable sidewalks. Will 23rd be the city’s first big test for dealing with a road designated as a “multimodal corridor” in the Bicycle Master Plan? With millions of dollars in federal, state and local funds behind them, the city is beginning outreach for a repaving, transit efficiency and complete streets redesign of 23rd Ave stretching all the way from Rainier Ave to E John Street. If everything goes smoothly, work could begin in mid 2014 and wrap up in 2015. You have a chance to hear from project planners first-hand tonight (Monday) at the Jackson Place Community Council meeting, 7:30 p.m. at the Hiawatha Place Lofts. Also on the agenda: Judkins Park Light Rail Station planning. 23rd Ave is the last remaining four-lane street through the heart of the Central District, and is the site of several of the most dangerous intersections in the neighborhood for all road users. The intersection of 23rd and Jefferson is one of the most dangerous intersections in the entire city for people walking. Five people were struck by cars there between 2009 and 2011. Between 2001 and 2009, four people were killed in collisions on 23rd Ave—two people on foot, one person in a car and one person on a motorcycle. This makes 23rd Ave by far the most dangerous street in the CD. Seattle laws require that every transportation project go through a complete streets process in which the needs of all road users are considered in the new road design. There are no details on any plans for the street at this point as the city is just beginning the outreach process. There will be an open house in February so residents can get a look at options and give the city feedback. The project could also see transit improvements, including trolley wire connections that would allow the 48 to run as an electric bus from the Mount Baker Transit Center to the University of Washington. This improvement is part of the city’s Transit Master Plan, and would require the 48 to split into two routes: One that runs the route south of UW and one that runs north and west of the UW to Ballard. For more on this, see our previous story. Traffic volumes on 23rd Ave between Jackson and Rainier are about 18,700 vehicles per day (counting buses and bikes), according to SDOT data. This is below the threshold the city typically considers prime for a “road diet,” often in the form of adding a center turn lane and reducing general travel lanes to one in each direction. A recent road diet on Nickerson (which moves about 2,000 more vehicles per day than 23rd) reduced collisions by 23 percent without significantly impacting traffic flow, according to an SDOT report I wrote about on Seattle Bike Blog. For a local comparison, MLK see only a couple thousand fewer vehicles per day than 23rd (about 14,000), and it easily does so with one lane in each direction plus a center turn lane (though the outdated bike lanes on MLK are terrible). A Dexter Ave bus island as seen from the bike lane. At the Squire Park Community Council quarterly meeting over the weekend, 23rd Ave project leaders mentioned Dexter Ave as an example of a recent street reconstruction project that got a complete streets redesign. On that street, “bus islands” and bike lanes with larger-than-normal buffer spaces were constructed to speed up transit and provide safer movement for people on bikes. Shorter crossing distances for crosswalks made the road safer and easier to cross on foot, and motor vehicle flow was not significantly impacted. If you haven’t picked up on it yet, I am quite excited about this project. 23rd Ave is a barrier in the CD that should be a destination instead. Imagine being able to cross 23rd on foot at every intersection without sprinting for your life or going four blocks out of the way to nearest stoplight. Imagine more welcoming bus stops and more comfortable sidewalks. Imagine quiet electric buses instead of diesel-belching ones. Imagine if very few people drove over the speed limit, and fewer people got injured or killed simply trying to get wherever they’re going. And yes, imagine being able to safely bike to 23rd Ave destinations. All or some of these could become reality. What would you like to see happen on 23rd Ave? This entry was posted in news and tagged 2012 bicycle master plan update, 23rd ave, central district, central district news, sdot. Bookmark the permalink. I agree that 23rd Ave in the CD is now a very dangerous street to even think about cycling on, but I think it would be better to think about using alternative routes which are definitely a lot calmer as well as better in regard to the topography of the land. I used to take 23rd and use sidewalks (I know not wise) as an alternative to using the busy street, but then I wised up and I now use 20th and 21st Avenues instead. Not only are these streets a lot calmer than is 23rd Avenue, but the topography of the land is easier to bicycle on than is 23rd Avenue. I’m not saying it’s a bad idea to do something with 23rd Avenue, but it might do bicyclists a better favor by suggesting that alternative routing might be the better idea to solve the cycling problem in the CD. I agree regarding the bicycle routes, but keep in mind this is about a lot more than cycling. Rechannelizations are about making streets safe for everyone — bicyclists, pedestrians, and drivers included. There’s no need to have a 4-lane highway slice through the neighborhood. Also, remember the transit connections. A bike facility on 23rd would connect to Mt Baker light rail station, something no alternative route would do (well, directly, anyway). And some day there will be a light rail station on 23rd above I-90. 23rd is simply the most obvious and direct road to these stations. Neighborhood greenways in the area would be great, but they are not replacements for an on-street facility. That line of thinking moves us backwards, not forwards. I don’t mind riding on 23rd as is (riding in city traffic doesn’t generally bother me), but I’ve quite a few times had the misfortune of trying to cross it—on bike, on foot, and in a car. That’s when you really see the neighborhood-slicing effect you mentioned. There are few crosswalks and few traffic breaks, and because it gives drivers a highway mentality, no one thinks to stop for pedestrians. So you end up sprinting across with cars barreling down at you from both directions. I’d hate to make that crossing with a stroller or in a wheel chair. Whether or not it’s the best cycling route is, I think, beside the point—it’s not safe in its current state. Oddly enough, I could imagine a scenario where we would actually ADD parking to 23rd. 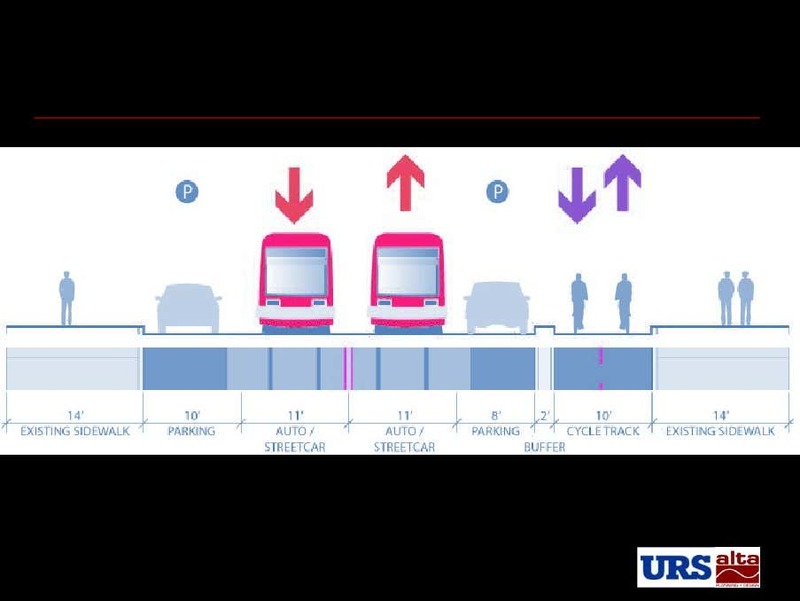 For example, if it went: curb, two bike lanes (one for each direction), parking/bus islands, general traffic lane, general traffic lane, curb. So, for example, southbound buses would still pick up at the curb, but northbound buses would pick up at new bus islands, freeing up space on the sidewalk. There would be a lane in each direction with turn lanes at traffic signals as needed, buses would maintain its efficiency by stopping in-lane, crossing distances would be half what it is today, crosswalks could be safely installed at every intersection, and there would be safe bike lanes. Very few negatives and tons of positives. That said, I’m not a traffic engineer, so I’m eager to see what they come up with. I think a center turn-lane would be prioritized over parking, as it would get left-turners out of the way and keep traffic flowing with just the one lane in each direction. But I love the idea of the a two-way cycletrack on one side of the street. On the other hand, the parking lane / bus bulb part would be a great way to provide physical separation for the cycletrack. Also, buses instead of streetcars, of course. That’s vaguely what I’m imagining. With Broadway, the turn lanes only appear before major intersections. Essentially, it trades places with the parking lane as needed. I’m sure there are plenty of options for how to use this space. The reason I suggest a parking lane could make sense is because the bus islands would be required for transit efficiency. And the space used for the bus islands would need to be taken up by something between each island (and parking is cheaper than planters). I’m not an engineer, and I’m sure that are lots of ways to go with it. I’m just trying to get people thinking outside the box that we’re used to. indeed, if transit efficiency is one of the goals of this project, and a road diet is shown to be feasible, they are likely going to want to reduce delay (and crash risk) associated with vehicles turning into driveways, and therefore a center turn lane will more than likely be part of the design-there are a lot of driveways and only a few opportunities for driveway consolidation. The driveways present some challenges for a cycle track as well-could probably work if there is no on-street parking obstructing views at driveway crossings. Still with 44 ft curb-to-curb width a 3-lane section will leave lots of room for a high quality bicycle facility-just a lot of design considerations from a safety and traffic operations standpoint. For those of us that drive on 23rd daily, traffic is going to be effed up. Great for our property values, but lol at the frustration incoming. So, is your solution to just leave things as they are with 23rd Ave being a drag strip? No one ever said that there might not be some pain involved before things improved. A few years ago I got T-boned on 23rd Ave S at Norman street with a fellow who was probably going 45 M.P.H. My Mazda pickup got totaled. Luckily I was not killed or injured. Wow, Joseph. I’m glad you’re OK. That sounds terrifying. John has a pleasant surprise ahead when he sees that 23rd works just fine, likely even better, with one lane each way plus a new center turn lane. It’s not a busy street, but it FEELS busy because traffic moves in fast, angry clusters. Go hang out on the sidewalk for a few minutes and you’ll see what I mean.